Kid Nichols starred in the 1890s for Boston, leading them to five NL pennants. 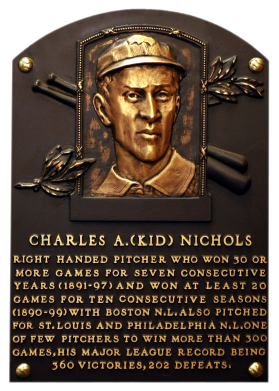 Winner of 30 games seven times, Nichols started what he finished. In his 501 Boston starts, he was relieved only 25 times. He had a lifetime 361-208 record and a 2.94 ERA. Comments: In November, 2002 I picked up several 1976 Shakeys tribute cards including George Sisler, Kid Nichols, Joe Medwick, Billy Hamilton, Roger Connor, Charles Comiskey, and Sam Thompson. Some were submitted to and graded by PSA in January, 2003. The Nichols came back a NM-MT 8. Eventually, I wanted something issued during Nichols career. I learned of the Fan Craze card but in my research found that it wasn't Nichols pictured but someone else by mistake. So, my wantlist was updated with the only card left - the N300 Mayo. A couple years later I was surprised when I found an item picturing Nichols that I didn't know existed. I remember finding this Supplement as I scrolled through the online pages of the August, 2011 Legendary Auction. I bid on the item in the late hours of the final night and won. I happened to be supporting a client in Lake Forest, IL at the time and decided to drive and pick up the article in person. Legendary Auctions was located in Lansing, IL - 1 ½ hours south in traffic. I took an early lunch and made the trek. Three hours later I was back in the office with the Nichols in hand. Love this piece. 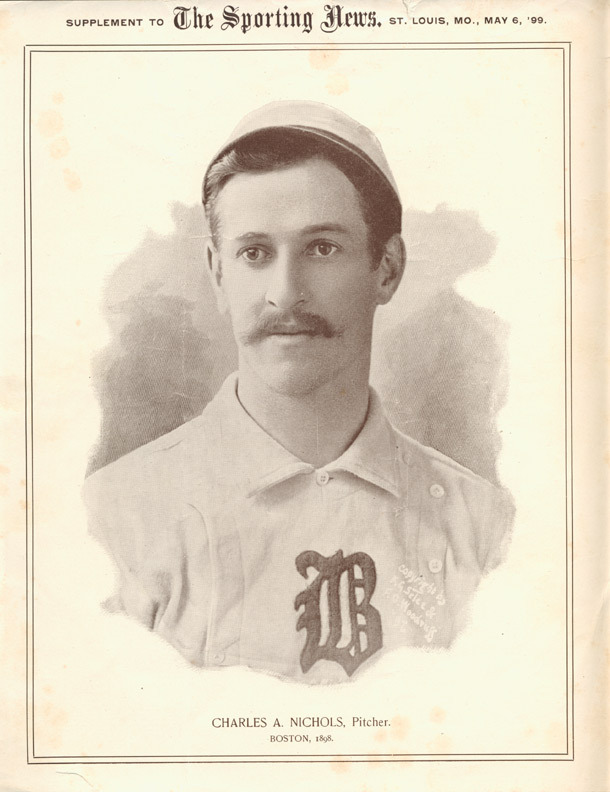 When this photo image of Kid Nichols appeared as a supplement to The Sporting News in 1899, he was already a legend of epic dimension. The piece is a strong EX, despite a little foxing and a couple of minor tears in the edges. There's a small mystery in this photo that's worthy of mention…the Kid's image here bears a copyright claimed by "F. G. Selee" along with another guy. 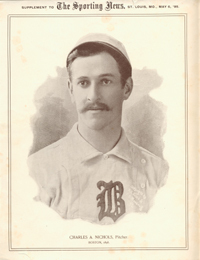 Recently inducted Hall of Famer, Frank Selee, managed the Beaneaters during much of Nichols' lengthy tenure with the team. 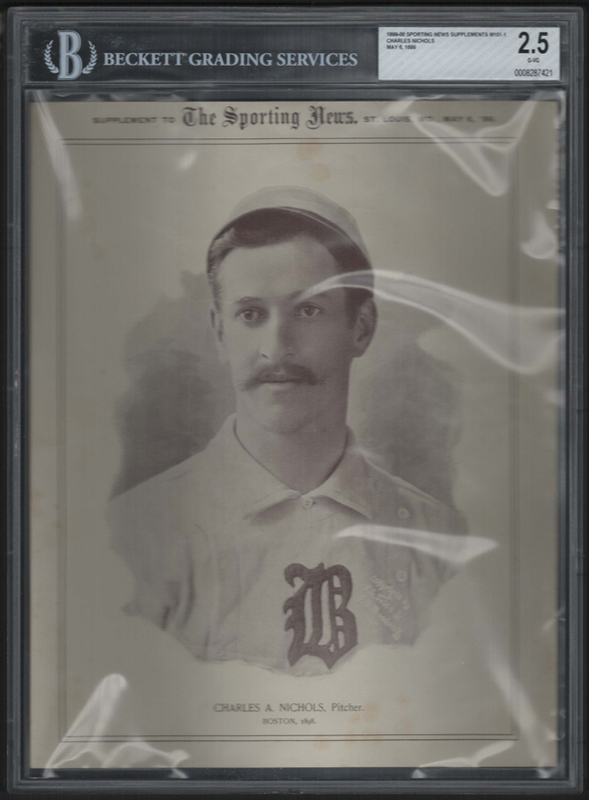 UPDATE: Beckett slabbed the item G-VG (2.5)! 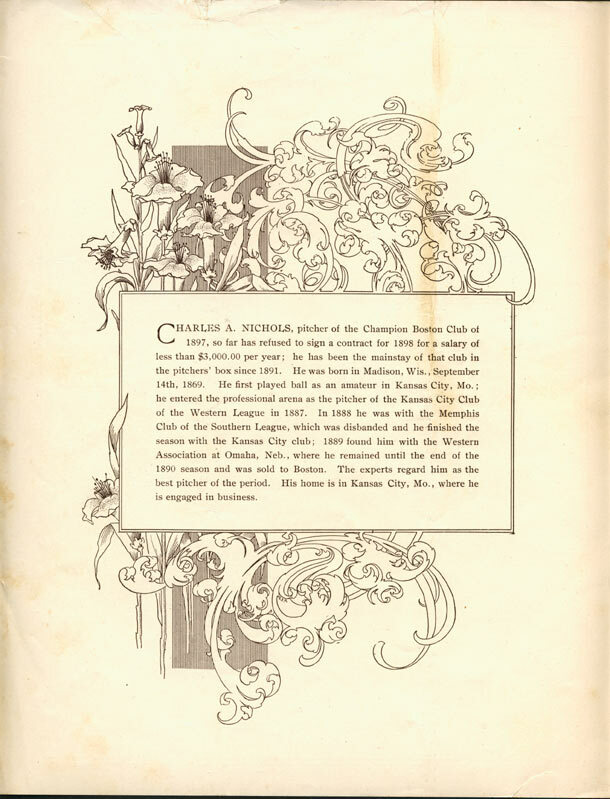 For much of 1899 and 1900, the weekly issues of the Sporting News included a baseball portrait supplement. About 10" X 13", the pictures offered vignetted photos of the era's stars on a glossy paper stock. Virtually all pictures were formal head-and-shoulders portraits; some in uniform, come in civilian clothes. A handful of players ared depicted in full-length poses. 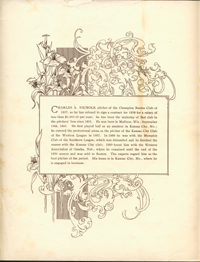 The pictures were produced for the sports paper by National Copper Plate Co., (which issued its own set of prints). 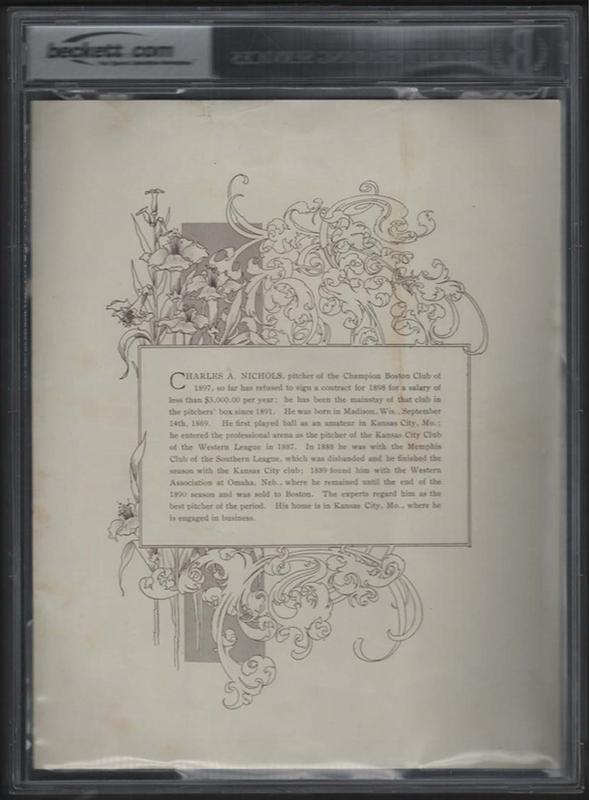 The TSN supplements have a logotype above the photoand the date in which it was included in the paper. Full player name and team/year are printed at bottom. Backs have a small box offering career information. Besides offering the pictures with weekly issues, portfolios of 50 could be had by starting or renewing a subscription for $2 a year.